Among all the elements of the fisherman, the fishing hat is one of the most important. If the hat is incorrectly selected, the result may be overheating / hypothermia of the head, a heat stroke or cold, and an inconclusive end for fishing. Special equipment for this type of outdoor activity differs significantly from ordinary clothes, in order to protect a person from weather conditions, is equipped with special elements and functions. This cap made with a cool mesh back and there is great range of colors to choose. 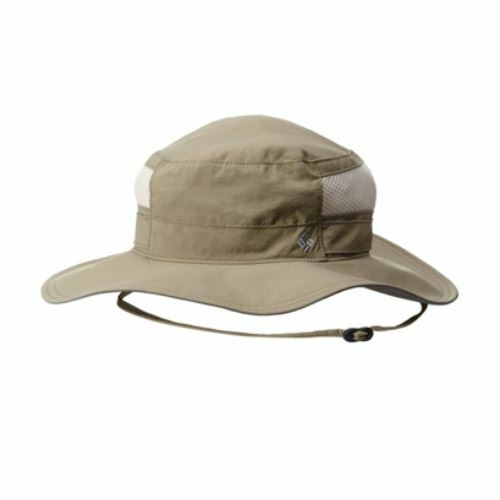 The PFG ball cap protects face from the sun. This is a common adjustable snap-back closure that makes it easy to have comfortable fit. Columbia PFG Mesh Ball Cap has great design and FlexFit construction that provides a secure fit. There are S/M and L/XL sizes. The mesh back lets excess heat escape. It’s made of 55% polyester/43% cotton/2% Spandex. The sticker on the left visor collects dirt and dust. The hat runs small and shallow. This fishing hat represents high-performance that copes with the heat, provides UPF protection and blocks harmful UVA and UVB rays. The hat features Omni-Wick technology keeps cool. Omni-Shade UPF 50 protects from the sun’s harmful rays. Omni-Wick sweatband and mesh venting pull moisture away from the skin to keep head cool. The adjustable draw cord and toggle are at back. The brim is made of tough material and one side flops down and doesn’t stay up, blocking the view. Unisex Summer UV Protection Outdoor Camouflage Hat is made of 100% Polyester. It combines soft, lightweight and durable features. The hat keeps the sunlight from the face and neck, protecting from the damaging rays. The wide brim can be folded up or kept down. It is great hat in preventing the rays of the sun from damaging the face and neck. The hat features a high-quality craftsmanship. It is foldable and crushable, and it can be worn differently. The hat is not machine washable. Lindo represents simple and cool design, which spends time outdoors, but particularly fishing. 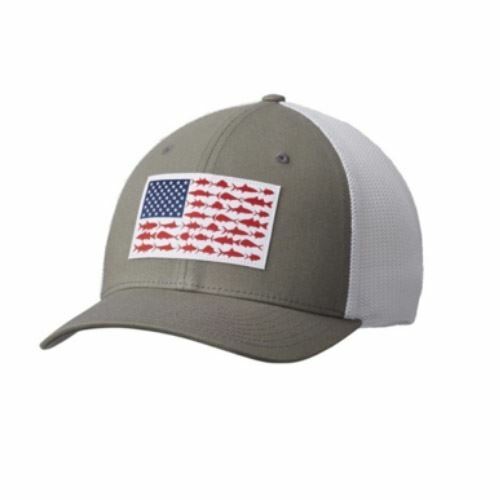 The embroidered logo is placed on a high quality fishing hat. The front sides and back are made with mesh. The hat has an adjustable plastic snap closure. The bill comes with a modest curve, but can be shaped. The hat is comfortable and pretty lightweight. The cap is well made. It is able to resist the water but when it gets wet the cap dries quickly. It will fit any size of the head thanks to adjustable snap. Customers claim the snap mechanism is cheaply made. Omechy uses high-quality materials to meet all the requirements of fishermen. It not only features a fashionable style but also a practical design to make feel comfortable during fishing. If you spend a lot of time outdoors and want to have great protection for skin from the sun then it can be the best choice. The hat’s shape allows air to circulate, keeping the head cool. Hat protects from water and dries quickly. Embroidered design with decorative rope. Both sides have buttons to change style. The inside material of the hat is similar to net that’s very rough and makes feel uncomfortable. With this super protective hap you can note its comfort and durability. It is also lightweight, doesn’t make you sweat and foldable. The neck and face are protected with the breezer. Hat features vented mesh on the bowl of the hat. It provides sweat quick-drying feelings and makes wearing it comfortable, There’s a rope and elastic regulator, which can be adjusted to comfortable fit and it provides a secure fit in windy days. The neck and face protector fabric is not tough enough. The face protector has a one Velcro fastener that is not long enough and not adjustable. 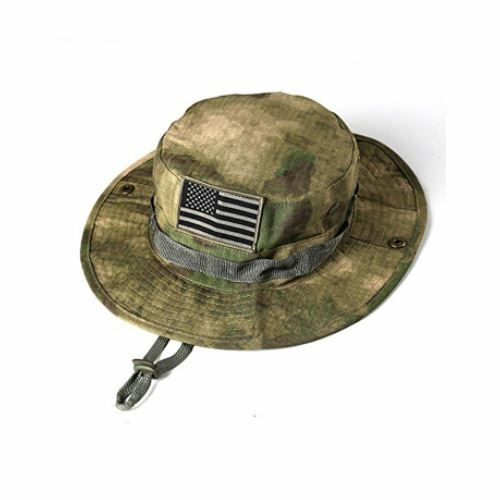 The Sinddy Military boonie is made with modern digital finish that is highly effective. It also features an American flag and great camouflage patterns. The brim is slightly thicker than other hats, which provides more rigid coverage. 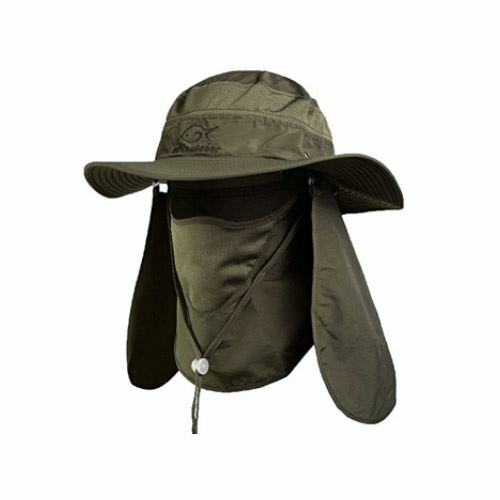 The brim extends wide enough to protect the back of the neck and covers skin to avoid sunburn. There is an adjustable chin strap that provides secure fit. The four brass screen vents provides the required ventilation on hot days. There are two brass snaps, which allow pinning the sides. Some claims the hat is smaller and doesn’t fit right. This great fishing hat can be right choice if you want hat that fits no matter what size is. The hat fits comfortable on the head and it comes in different color options. The comfort is provided thanks to mix of polyester and cotton materials. The mesh section provides good ventilation so the head won’t be overheated. Adjustable string lets to make fit comfortable. Headband doesn’t absorb moisture well enough. It is not machine washable, so should be treated carefully. Here is the most widespread fishing hat like bucket. It is made of 100 % of cotton with metal ventilation eyelets. It is available in 2 sizes. There are also 16 options of color and a few camouflage patterns. The material is soft and smooth. It is also very lightweight and breathable. There is a chin cord attached to the hat to make it secure. It also has snaps on both sides of and a drawstring with an adjustable slider. The brim of the hat can be flimsy and blocks view when it gets windy. 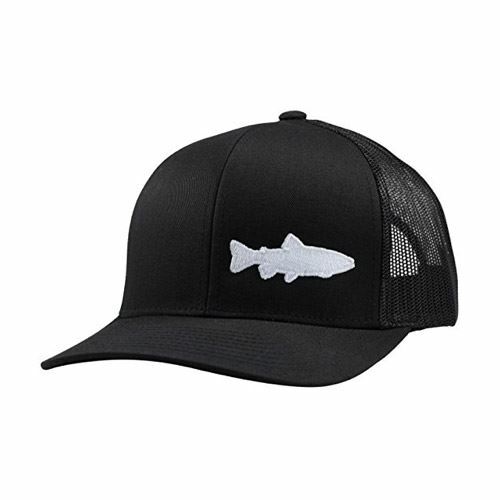 This modern fishing hat is perfect for many anglers. It is not only stylish but comfortable in wearing. 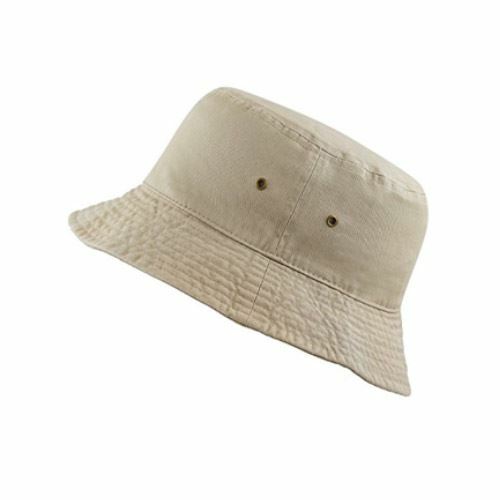 This bucket hat is made of high quality cotton, and comes in 2 sizes option. There is great variety of hat’s colors to choose. It is extra lightweight and can be easily packed into the bag due to its foldable. The sizing of the heat turns to be rather big. Absolutely all hunting hats and their fishing counterparts are oriented to different seasons of the year. Summer fishing hats are lightest models, mostly camouflaged, with a mesh to improve ventilation and air exchange. Basically, they are designed to protect from direct sunlight. Demi-season hats are more dense, mostly waterproof and wind-resistant models. Also they have the function of keeping heat. They also have a lot of options for a camo pattern. Winter hats are dense, maximum warm with good air exchange and moisture. In addition to the hat, there are a few of special fasteners and fasteners for various optional accessories. A variety of materials are used for hats of this type. For light, summer models, waterproof polyester or natural cotton is used. Demi-season models are often made of a combination of acrylic and heat-insulating materials. Acrylic does not absorb moisture, which is important in conditions of spring and autumn weather changes. Winter models are often made of such popular, pleasant to the touch material as fleece. 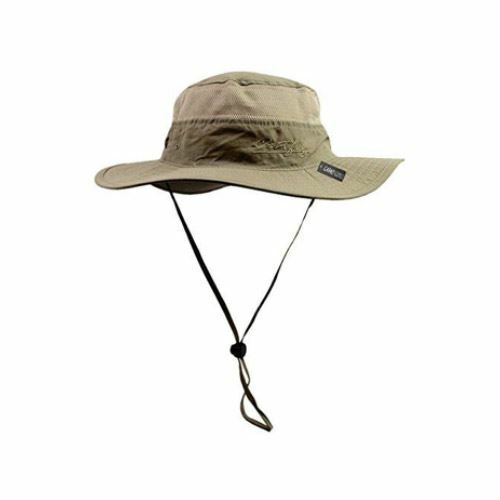 A good hat for fishing should be able to protect its owner from direct sunlight and from sudden rain, and even preferably from insect bites and prey sight. Therefore, a summer hat with a mosquito net is quite popular. In addition to the traditional hats for fishing, there are also mask hats that will cover and protect your face and throat even in the most windy days, and thus save them from frostbite and airing. The hat should fit well and not interfere with the normal functioning of hearing and sight. 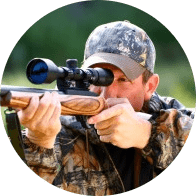 This is important for a successful aiming or timely reaction to the movement of the float rod. In order to this, there should be an adjustable strap so you can regulate the size of the hat. The head should not sweat. This applies equally to the summer and winter season hats. To do this, all the caps are made with a ventilation system, which additionally removes excess heat. Quality headwear is always designed for a long life. Even after a large number of washing cycles, it should retain its original color, and the seams remain intact. Baseball caps for fishing are a classic wardrobe item that not only adds a stylish look, but also has direct functional properties. The cap creates the necessary shadow, thereby making possible a good sight and an accurate fishing even in bright sun. Moreover, a quality baseball cap can even protect from rain for a short while, enabling you to find a suitable shelter and at the same time keep your head dry. Adjustment of the size is conveniently carried out by the usual Velcro fastener located at the back of it. Fishing caps are made of a dense blend fabric that is resistant to sunlight and which practically does not shrink during use, which means the cap will have a nice appearance, and won’t require a replacement for a long time. The best choice of this type of hat from our list can be Columbia PFG Mesh Snap Back Ball Cap. Such caped cap is totally awesome for angling situations. It’s wide neck and overflow top keeps neck and head from harmful sun rays or from getting wet, and air vents prevent sweating and bugs, alongside a jaw tie keeps it secure. 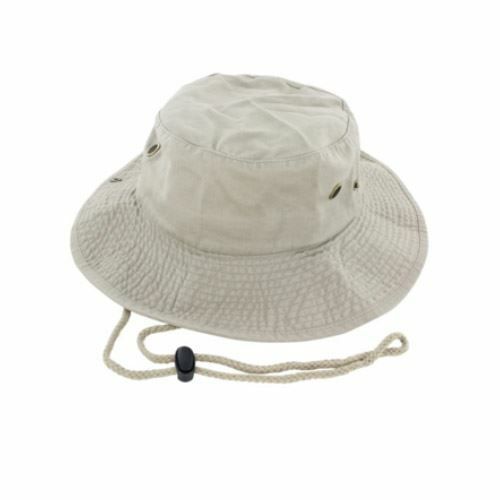 Columbia Sportswear Bora Bora Booney II Sun Hat from our list worth your attention. This type is also widespread among anglers and suitable for protection from the sun. It has short brim and covers head but there is not enough protection for neck and ears. If you are going to spend hours or even couple of days then this is not the best choice. 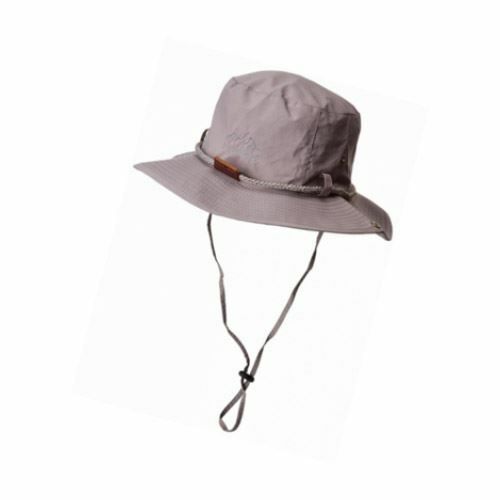 Pay attention to DealStock Boonie Fishing Bucket Men Cap. Usually hats for fishing come in one universal size. Since you order hat online, you can’t be sure that hat will fit you right. The thing you can do is to find out the internal dimensions. The hat will fit well if it has adjustable straps so you can tight or lose the hat. In order to protect head from the sun it is better to choose hat of a bright color, which can reflect glare. Hat of the dark colors also can be a good choice as it doesn’t let the glare to pass through but dark color absorbs more heat than bright one. 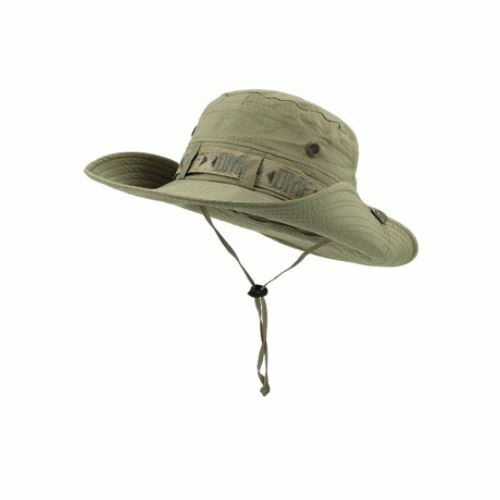 Very often manufacturers provide hats for fishing of khaki, grey or brown colors. The price depends on the quality of the hat, which includes its style, material and other additional accessories. There are both cheap and expensive options of fishing hats. The cost may range from $10 to over $100. In any case, the ideal fishing hat should feature several important functions: it has to be lightweight, maintain normal heat exchange, protect from adverse external influences. Hat should not soak and dry quickly when it gets wet. It is highly desirable that hat is made of natural materials. This is not only a matter of durability and convenience, but also of the fisherman’s health.